Where’s the Party? How to Benefit From Favorite Celebrity Hangouts in Vegas – TAM Card® Nation in Vegas! New York may be the city that never sleeps, but Las Vegas is the city that keeps bringing people back. This town has always been a hot spot for those looking to get away from the daily grind and live it up, and those people keep coming back for more. It’s not just the Average Joe’s that appreciate a trip to Sin City, celebrities and public figures are also frequenting our town. The popular saying goes, “What happens in Vegas stays in Vegas,” and those who live their lives in the public eye can’t help but be seduced by the idea of getting off the grid for a few days. However, in a world of Twitter, Facebook and smart phones, that isn’t always possible. Not only can we read about where these famous players like to hang out, if you’re lucky enough to work at an establishment that’s frequented by a fan favorite, you can bet that more guests will come pouring in if that news becomes common knowledge. The publicity and press a club or bar gains when an A-lister is photographed having a good time in their establishment is invaluable. Look at the recent example of the cast of Glee partying at the Bank Nightclub at the Bellagio for Naya Rivera’s birthday. (Las Vegas Sun). Pictures of the event showed up in magazines and in gossip blogs all over the country, and the name Bank Nightclub will remain in the minds of those heading to Vegas in the next couple of months. As we mentioned in our blog post, “Share the Vegas Inside Scoop for Bigger Tips,” one way to capitalize on this type of knowledge if you work in a bar or restaurant is to share with your guests about which celebrities are in town, and where they will be partying. 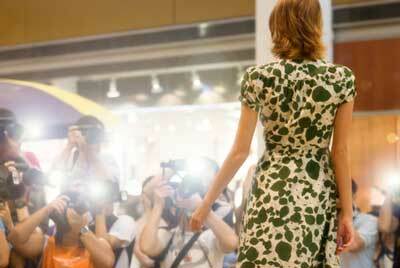 Use social media to stay close to the latest celebrity news. ClubPlanet wrote an article titled, “The A-List Hangouts: The Top Celebrity Hotspots in Las Vegas” sharing some of the most popular celebrity hangouts in town. Much the same, your guests will appreciate knowledge about any celebrity shows going on around town. One example would be Nick Cannon announcing he’ll be performing stand-up comedy at the Palms, which was recently reported on Vegas.com’s blog. Long-time favorites and well known performers who appeal to a wide audience, such as Celine Dion, are also worth keeping tabs on. She is, after all, preparing to return to Caesar’s Palace for performances beginning in March. (CelineDion.com). A working knowledge of who is performing where, and how to obtain tickets, can be a valuable tool for a service professional. Have you recently been star struck by seeing anyone famous in Vegas? How do you stay on top of all of the latest news about who is in town, and where they’ll be? Previous Call It What You May … Alcohol Awareness Card … Alcohol Education Card … Drink Card … But There’s Only One TAM Card!